Kyle Mangas eyes a possible rebound on a free throw attempt Tuesday night. 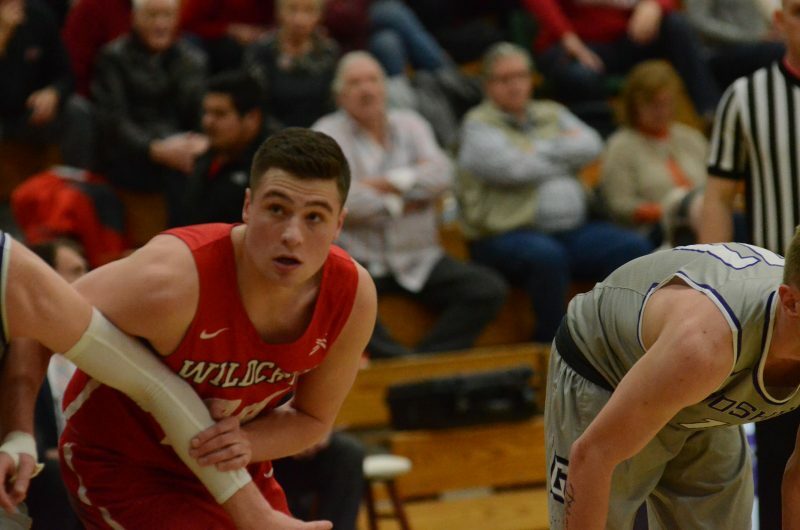 The former Warsaw star had 17 points and a career-high 13 rebounds to help his Indiana Wesleyan team win 85-69 at Goshen College. 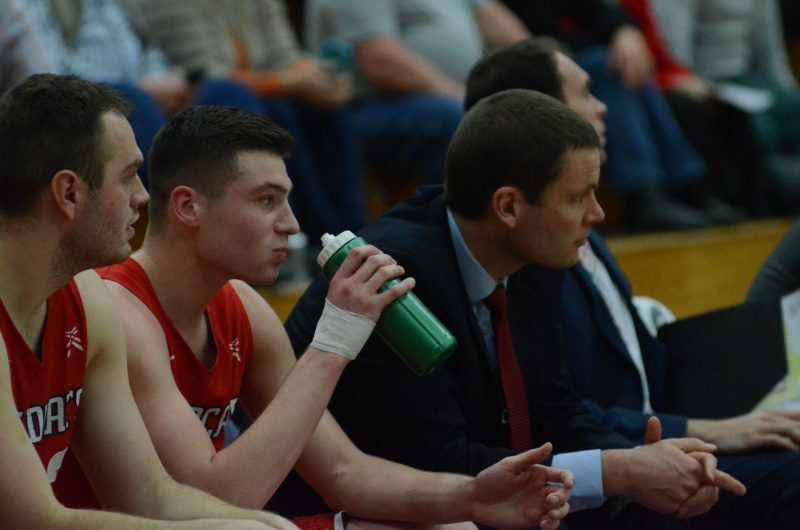 GOSHEN – Indiana Wesleyan University men’s basketball coach Greg Tonagel is one smart man. He knew that Kyle Mangas would come in and be an impact player as a freshman for his oustanding program. When a coach with Tonagel’s credibility though says that his star guard has even exceeded his expectations it tells you just how good Mangas has been this season. Even the humble, soft-spoken former Warsaw standout has to admit that it’s been an okay start to his collegiate career. It’s been huge for the No. 8 ranked Wildcats. 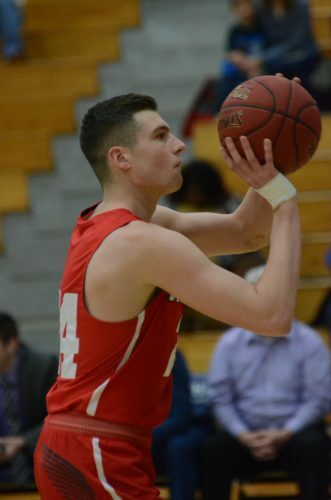 Freshman guard Kyle Mangas leads IWU is scoring, assists, steals and 3-pointers. Mangas, a 6-3 backcourt stud, entered playing Tuesday night leading his team in scoring at 21.5 points-per-game while shooting 54 percent from the field overall, including 40 percent on 3-pointers, and 74 percent from the free throw line. He was also tops on the Wildcats in assists, steals and 3-pointers. Mangas, who led his Warsaw team to three straight Northern Lakes Conference titles and back-to-back Class 4-A sectional championships, is just so efficient. 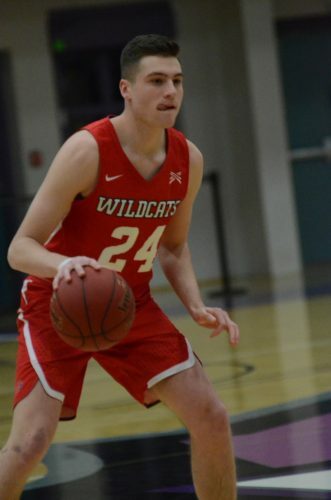 He scored 17 points Tuesday night on 6-11 shooting from the field and worked his tail off for a game-high 13 rebounds as IWU crushed the host Maple Leafs 43-22 on the glass. The 13 caroms were a career-high and it was also his third double-double of the season for his team, now 17-6 overall and 8-3 in league play. Tonagel, who guided the Wildcats to NAIA national championships in 2014 and 2016, knows he has a special one in No. 24. “The thing about Kyle is that he is a scorer without volume (in terms of shots) and that’s a rare thing to have,” noted Tonagel, who has fashioned an eye-popping 347-97 record in his 13th year at IWU and was a star guard at LaPorte High School and then at Valparaiso University. “He does it in the flow of our system. He has poise and his ability to finish plays around the basket amazes me. Kyle Mangas runs the show Tuesday night. Mangas, who was an Indiana All-Star following his brilliant prep career at WCHS, picked his spots Tuesday night. He converted a gorgeous up and under reverse layup and followed that by draining a triple late in the opening half to help his team to a 40-25 halftime advantage. He then helped spark his team on a 12-2 run late in the game with a tip-in off his own miss, a layup and a beautiful alley-oop pass to teammate Evan Maxwell for a rim-rattling slam, to seal the win after the Maple Leafs had rallied within seven points. Maxwell, a 6-10 junior transfer from Kansas, scored 26 points as the Wildcats beat the Maple Leafs for the 19th straight time. Goshen, which lost its fifth straight game, falls to 10-13 overall and goes to 3-8 in conference play. Mangas, who was the Ink Free News Player of the Year the past two seasons, was impactful Tuesday night despite playing with a taped up right hand. He suffered a bad floor burn to his hand during practice last Friday. “Kyle accepts challenges and that’s why I think that there is a lot of room for growth with him,” remarked the 37-year old Tonagel. “We are going to challenge him and I know that he will respond. Mangas also relishes the fact that he is able to see his biggest fans in the stands, father Tim and mother Ann, all the time since he’s so close to home. The pair, who were both standout athletes at Wawasee High School, were right there again in Gunden Gymnasium Tuesday night. Kyle Mangas relaxes after another efficient effort on the hardwood.